The Main Barracks building was constructed of Hawkesbury sandstone by convicts between 1841 and 1846. The first building completed was the Officers’ Quarters which was completed in 1842. To achieve current fire rating requirements to this building an FRL of 90/90/90 was required for the ceiling floor system. The CAP508 intumescent paint system was incorporated into a Fire Engineered Solution to achieve the required rating on the original ornate pressed metal surfaces. 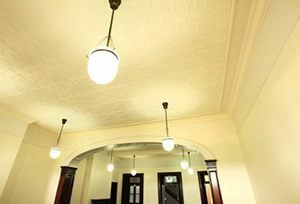 Historically significant ceilings were able to be restored, fire rated and retained.